Football season is upon us. While you won't find me at the bar, Seahawks gear on fleek, you will find me in the kitchen. Football season to me means calorie-laden, savory, comforting game day food. This post is the official "kick-off" of my Cannabis Infused Game Day Food series. These wings, oh these wings. 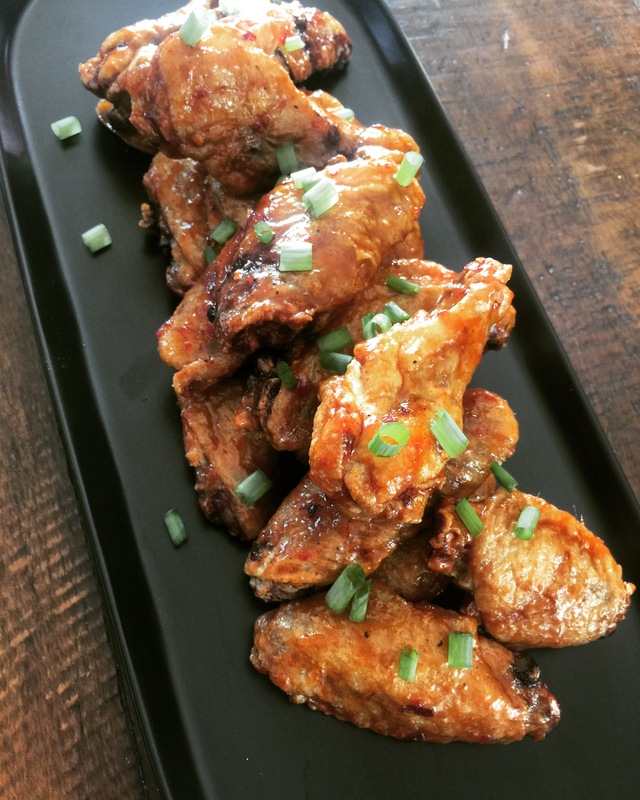 I've never had anything like them before and they are probably the best wings I have ever made. Maple syrup makes them sweet, vinegar and tomato paste offer a little tang, and the bourbon and rosemary are there to provide this amazing complex combination of flavors. They are also oven baked, which means no scary vat of hot oil and less calories so you can eat more of them. You will want to eat more of them. 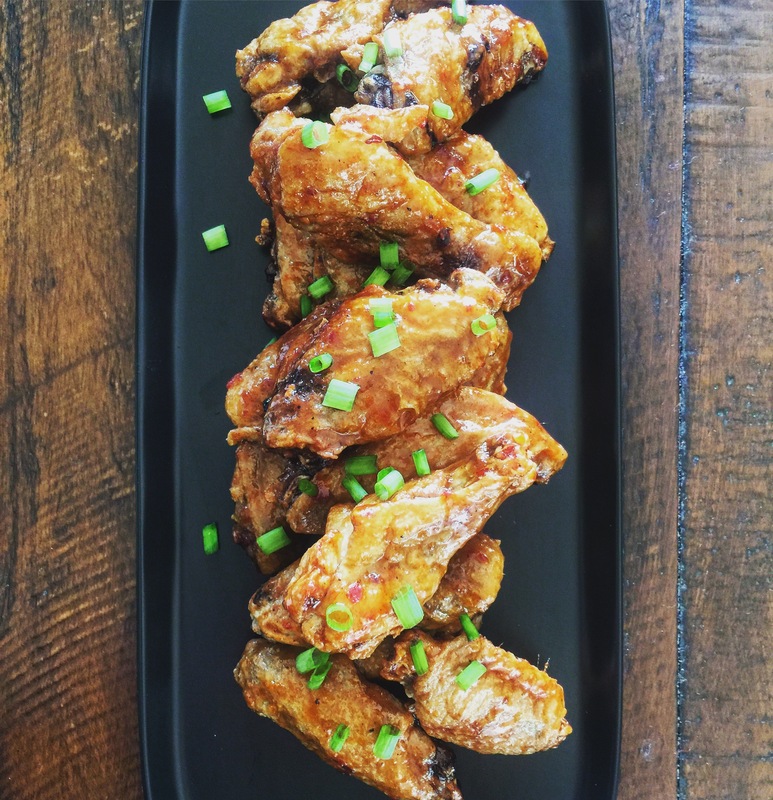 This recipe makes about 20 wings so if you're having friends over you'll want to double or triple it. To infuse these I used a grain alcohol based cannabis tincture that can be used to infuse almost anything. I will have a video up on how to make tinctures soon. For now you can find instructions online or use a coconut oil based tincture, like Blue Roots Cannabis Tincture in Natural for your infusion. 10ml of Blue Roots Tincture equals 100mg of THC. For the sauce, melt butter in a medium saucepan over medium heat. Add the grated onion and cook for 2-3 minutes. Add the bourbon, maple syrup, tomato paste, salt, pepper, and vinegar. Whisk to combine. Bring to a low simmer and simmer, stirring occasionally, until the sauce has reduced to a thick syrupy consistency that easily coats the back of a spoon. Once the sauce has thickened take it off the heat and allow it to cool. Add your tincture once it has cooled and whisk to combine. Preheat your oven to 250*F.
Rinse the wings with water and pat them dry with paper towels. Place them in a large bowl and add the baking powder and salt. Toss until the wings are evenly coated. Place a metal rack on your baking sheet and lightly coat it with cooking spray. Arrange the wings on the rack. Don't worry about over-crowding them, they are going to shrink a little bit. Bake the wings at 250*F for 30 minutes. Then raise the heat to 425*F and bake for another 35-50 minutes depending on the size of your wings. Remove the wings from the oven and allow them to rest 5 minutes. Toss them in your cannabis infused sauce and serve! !